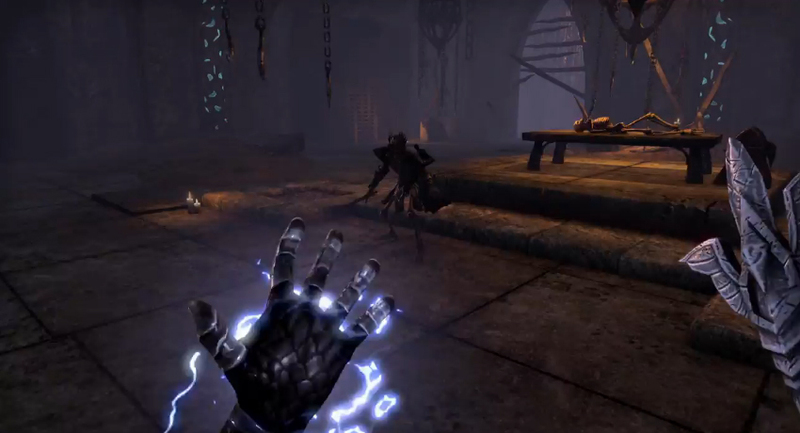 When we first showed Elder Scrolls Online to public we did not have a lot of the systems we had planned in the game. We had a very basic version of our engine and we completely rewrote everything, we completely redid animations, we completely redid the view. We were not originally planning to do first person view but we were planning to do things like progression, classes and stuff like that. First person view actually came along from direct feedback so we absolutely read all the feedback from all the forums, especially Bethesda forums and any other fansite forums. In a traditional games you don’t really have a problem of monsters being behind you. Everything is always in front of you. We never had to approach the challenge of what happens if somebody attacks you from behind. How do you see it? What do you see on your screen? Through the feedback we were reinspired to go back and redo that first person view. Now we have couple more animations to do, we are doing higher res. textures for all weapons. We have low res. right now so you might see some footage of the weapons not as clean as you expected. We will be doing much higher textures. The other big challenge was to make sure that we are able to get 200 players on screen all fighting each other, shooting spells, shooting siege weaponry, with destructible walls at the background, full weather, day and night cycles. We wanted to make sure that all this runs on all our systems. That was honestly a huge technical challenge, but it was something that we had in mind for the game the whole time. So you can absolutely can finish your story at the level 50, but at the time you hit level 50 you will have about 30% of your skills. You are able to get many more skills as you explore through the game. You can go to Cyrodiil and participate in PvP. You can PvP from the 10th level, but now it is the time to show who the boss is. You can go start doing Master Dungeons. We are launching with 16 regular dungeons and 6 Master Dungeons. Master Dungeons are the dungeons that you have already done but they contain more areas and continuation of the story. Enemies are different, bosses are different and loot is also different. You can go and do the adventure zones. Adventure zones contain special content maid for groups. Once you have finished content on your alliance territory, you can pick one of the other alliances and do their quests. Then you can pick the third alliance. So you can potentially explore all Tamriel with one character regardless you alliance choice. Each alliance is about 120 to 150 hours depending on how you go through it. We have pretty aggressive post launch schedule. Imperial city is under siege and we will be involving the story of the Imperial city post launch. We will also be introducing the justice system. Right now you can steal thing from the table and nobody is going really stop you. Justice system will affect all theft mechanics. We will also be introducing Thieves Guild and Dark Brotherhood with new story and quest lines. The way you get Emperor is you as individual earn Alliance Points in PvP. Alliance Points are firstly earned by either killing players or healing your allies. Taking a keep gives you very low Alliance Points. Keep gives your alliance increased territory and travel points and alliance wide bonuses. The more keeps your faction controls the better bonuses you have. AvA system stimulates players to take and hold a keep rather than taking a keep and leaving it without guards. In order to get Emperor your alliance has to control all the keeps around Imperial City. If you get that the person with the most alliance points, thus the person who has contributed the most to the alliance war, is crowned Emperor. When you crowned Emperor your faction receives alliance wide bonus which is really great. You also get an entire skill line dedicated to just the Emperor. You become the most powerful force on the battlefield. You are nearly unstoppable at that point. If you lose the crown you still keep the skill line but the powers are greatly reduced back down to the powers of the other skills. Having an Emperor on your side is not just a huge bonus in this situation. Having an Emperror in your alliance allows your faction to be more powerful in general. All groups of layers, PvP and PvE will feel the help of alliance wide bonus.